The tail is the last thing you see on the Whale Watch Kaikoura trip as the Sperm Whale dives off the South Island of New Zealand. Manu is a Sperm Whale that is often spotted in the waters off the Kaikoura Coast on the South Island of New Zealand. A cloudy day off the Kaikoura Coast has the perfect lighting to capture a picture of this large tail of the Sperm Whale. The water trails off the tail flukes as Manu heads under the surface for a deep dive. The large triangular shaped flukes on the tail are extremely thick and grow to be between 4 to 4.5 meters wide. A Sperm whale is one of the deepest divers amongst the mammals and can reach depths of 3,000 meters. The typical dive is around 400 meters and is usually between thirty to forty-five minutes long. 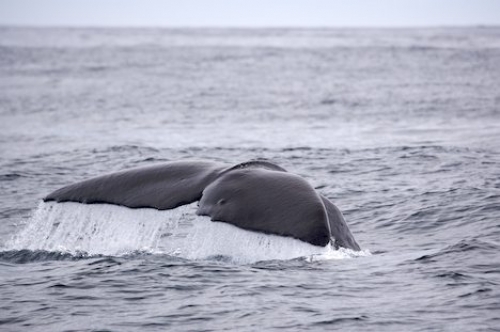 Photo of the tail fluke of a Sperm Whale off Kaikoura on the South Island of New Zealand. ... Once again, you will see the large tail of the Sperm Whale disappear into the vast ocean off the Kaikoura coast in New Zealand. Sperm Whale named Manu seen during a whale watching excursion with Whale Watch Kaikoura, Kaikoura, South Island, New Zealand. New Zealand photos and pictures from both islands.